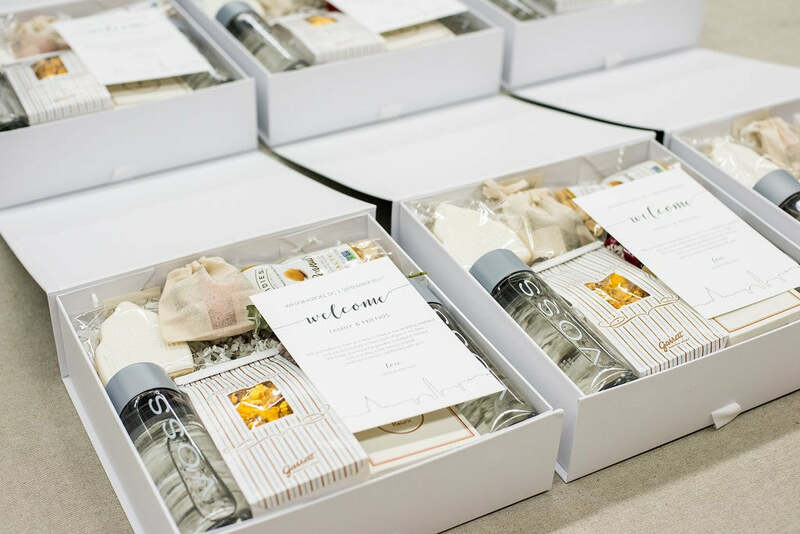 Neutral weddings are a favorite of ours here at studio Marigold & Grey and so are modern wedding welcome gifts. The more neutrals the better, if you ask us! 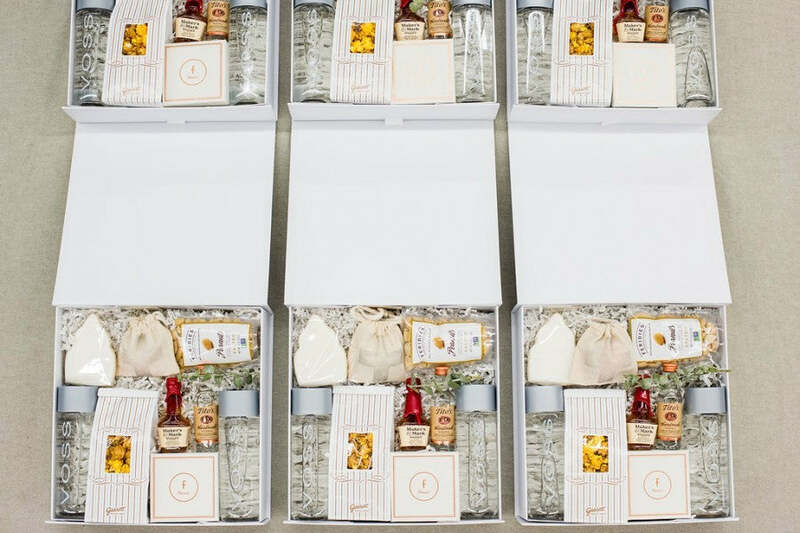 This project combines elements of both and so naturally, we are over the moon excited to share with you a recent custom gift design project we created for a classic Washington DC wedding at the iconic Mellon Auditorium, planned by Soco Events! To achieve this classic modern aesthetic, we selected white gift boxes that tie with white grosgrain ribbon. 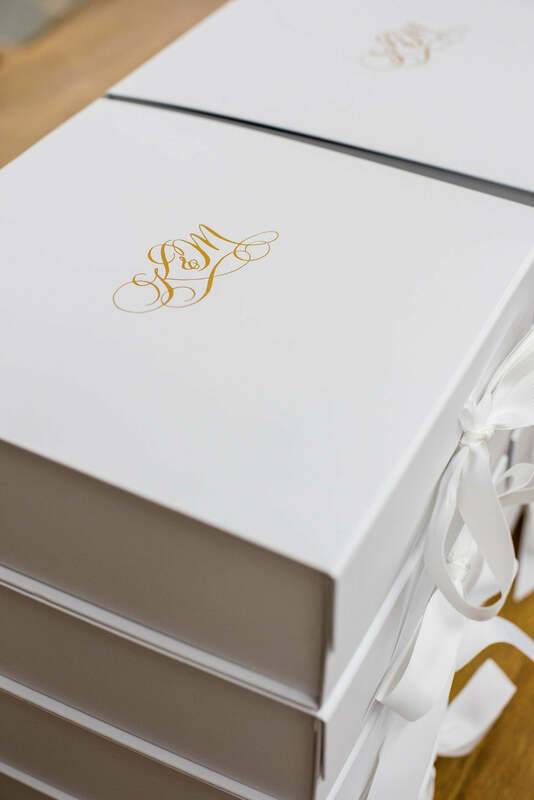 The boxes even featured the couple's gold foil monogram on the top. For this particular curated gift box design, we ditched our usual calligraphy gift tag all together in order to achieve this clean, sophisticated, chic look. As for gift box contents, our goal was to incorporate local items native to the DC, Maryland and Virginia area. Therefore, we included Virginia peanuts, a custom cookie in the shape of the US Capitol dome by Sugar Studio, and local artisan chocolates. 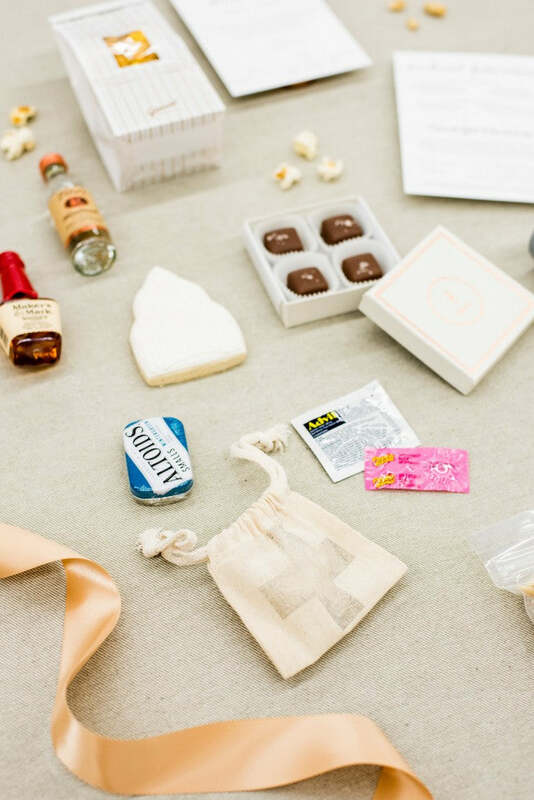 The groom happens to be obsessed with Garrett's popcorn and so, of course, we included a bag of their "Garrett's Mix" which combines both sweet and savory together! It was also perfect the Garrett's bags were all in neutrals. It was meant to be! 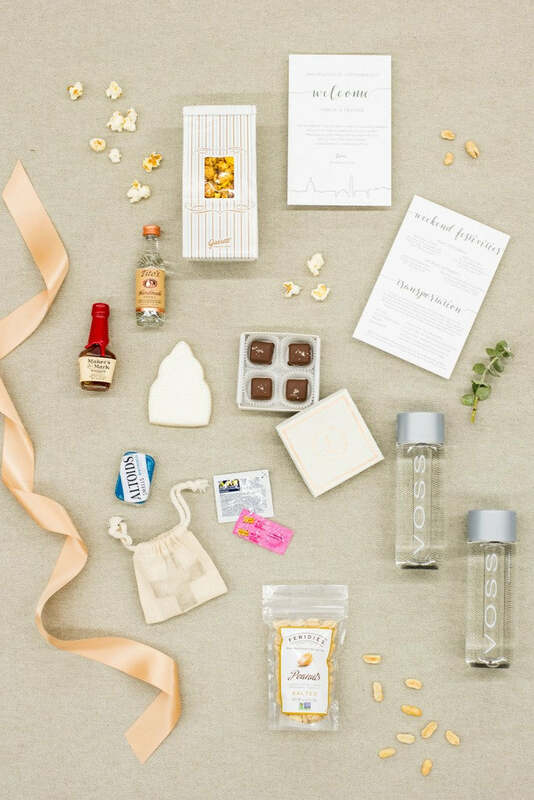 In addition to sweet and savory snacks, the gift boxes also included useful items such as Voss water and custom hangover kits with Advil, Pepto, and the cutest little Altoid tins. We packaged them in our signature drawstring pouches with a soft grey first aid symbol for added effect. It's not a secret that we are huge fans of custom welcome letters and these were certainly no exception. One side has a sentimental welcome message with an illustration of the DC skyline and the back side had important details such as the transportation schedule and weekend itinerary. By the way, in case you're looking for tips on how to write a fabulous welcome letter for your own wedding welcome gifts, visit HERE. 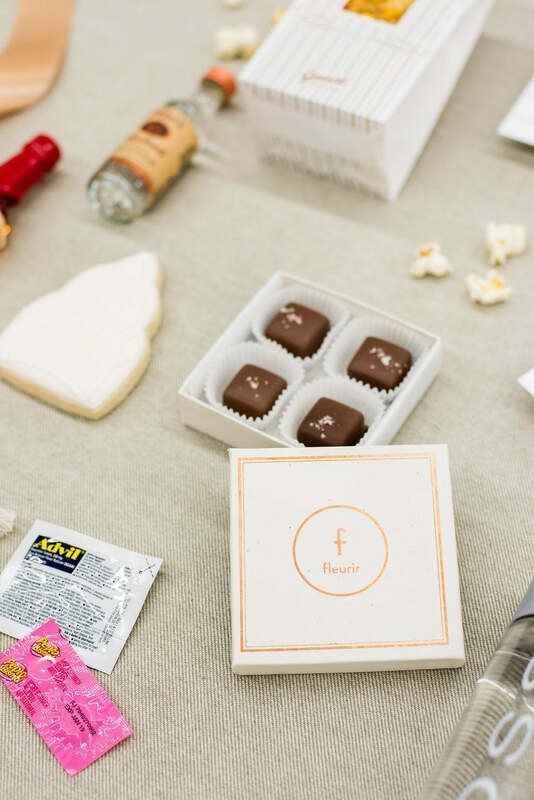 At the end of each year, we do a recap of our very favorite welcome gifts (perhaps you caught our recap from 2016?) and I have a feeling that these are definitely going to make the list! 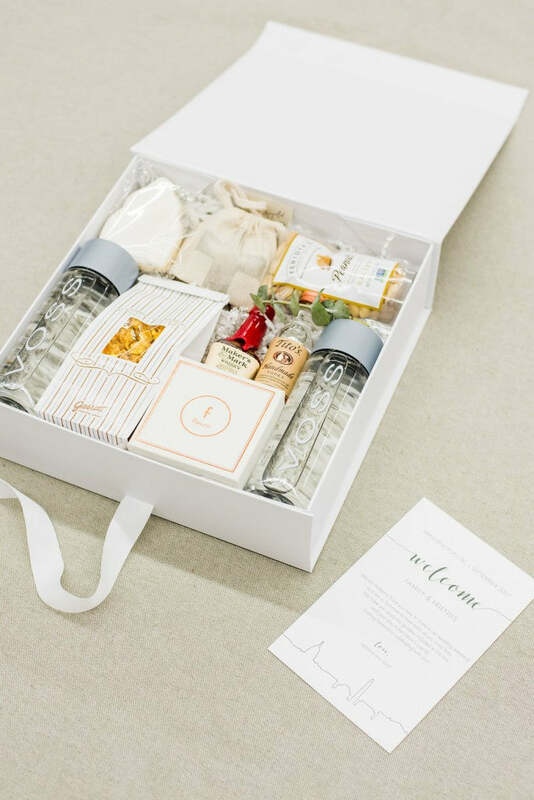 They have modern gift packaging, a cohesive color palette, locally sourced gift contents, a coordinating custom welcome letter, gold foil monogramming...need I say more? We'd love to know what you think of these gifts! Please leave us a note in the comments or reach out via our contact page. For more information on our Custom Gift Design Service, you can access our inquiry for here. We appreciate you reading and as always, we'd love to hear from you!